Over the past month, SpiceJet has been hit by a spate of bad news. As the airline's losses mount and troubles pile up, analysts worry about its prospects. The last week of July started happily enough for SpiceJet. On July 28, the Kalanithi Maran-promoted airline reported its elevation as the second-largest domestic air carrier after IndiGo, underlined by its market share of 19 per cent of passengers carried by all airlines. It also reported an improved load factor, or passengers carried per seat available, of 81.4 per cent against 73.3 per cent in June 2013. A day later, however, the sense of well being disappeared with the appearance of two news items in the media, which were soon followed by a series of others. 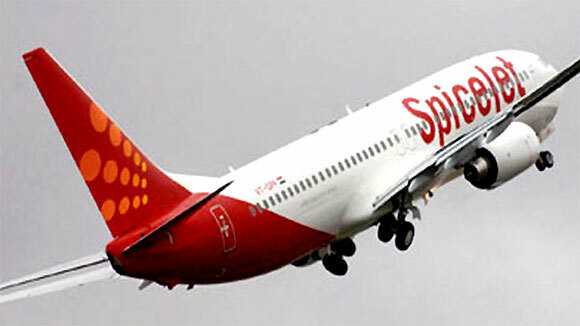 The first said the Directorate General of Civil Aviation, or DGCA, the regulatory authority, had instructed SpiceJet to refund meal charges and airfares to passengers inconvenienced by a delayed flight in June. The other alleged that not only had the airline's employees not been given their Form 16 detailing the tax deducted from their salaries, but that the airline had not deposited the deducted tax with the authorities at all. Adding to the airline's discomfiture, there were also reports that a cash-strapped SpiceJet had resorted to using mechanical parts from its grounded aircraft to service the flying fleet and that DGCA was keen to carry out an engineering audit. 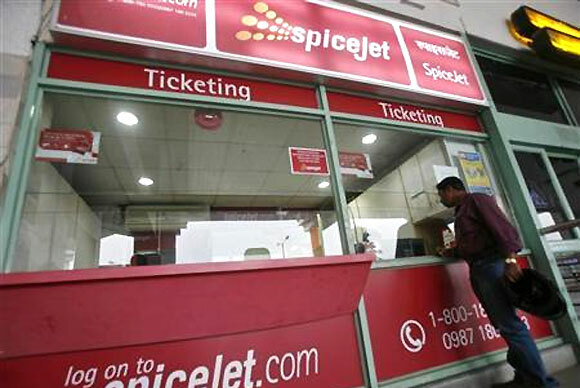 Image: Employees work inside a travel agency office besides a model of a SpiceJet aircraft in Ahmedabad. A more damning front-page item last Friday reported that Maran was actively looking to offload his 53.48 per cent stake in the airline in view of its faltering performance. These reports appeared plausible, given the no-frills carrier's financial problems. SpiceJet logged its highest loss of Rs 1,003 crore in 2013-14, and at the end of March 2014, its debt was Rs 1,738 crore. It reportedly has a cash balance of just Rs 5 crore, and its net worth has turned a negative Rs 1,019 crore as of March 31, 2014. 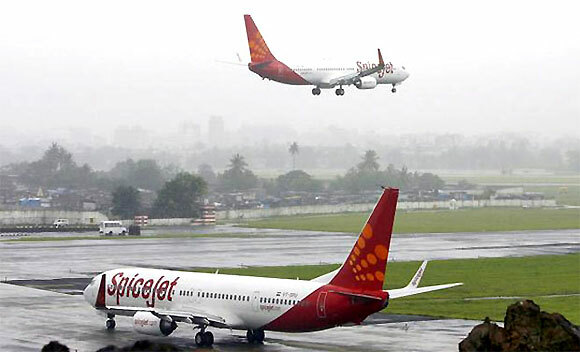 The civil aviation ministry also told Parliament in July that SpiceJet owed the Airports Authority of India Rs 110 crore in unpaid airport usage fees. SpiceJet was headed for the same future as the defunct Kingfisher Airlines. The damage was immediate: the company's stock fell around 17.5 per cent following the news. Sanjiv Kapoor The company quickly clarified that the news item about a frustrated Maran seeking an exit did not have any basis and said the airline "has received clarification from its promoters that there is no truth in the aforesaid news." Sanjiv Kapoor, chief operating officer of the company, in an internal e-mail to the employees, said, "SpiceJet is no Kingfisher". In an effort to contradict all comparisons with Vijay Mallya's defunct carrier, Kapoor pointed out that SpiceJet's "on-time performance is improving, loads are increasing, market share is increasing, it has all its aircraft flying, no aircraft has been grounded and cannibalised for parts, and it always pays all salaries on time." He says the employees have also been informed that the company was working to resolve the tax-deduction issue and has offered to "bear the cost of any interest or penalties" arising from the delay in giving them the Form 16. The company refuted reports about grounded aircraft and said it had to stop flying four planes due to technical issues that arose after a bird hit. 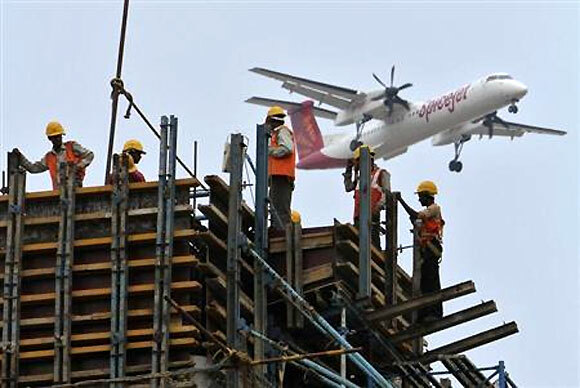 An analyst says that controversies related to tax, dues to airport authorities and payment delays to oil companies are part of doing business in the aviation sector in India. "These are not new in India," he says. "Whether one can question an airline's survival based on these depends on how serious the airline and its promoters are on the business. Jet Airways and Air India have faced and are facing these issues for more than two decades, and they are still in business." Despite the reassurances, the figures show that SpiceJet is bleeding. The question that arises, therefore, is what is keeping the airline afloat. Many say it is Maran's money. In 2010, the media magnate, head of Chennai-based Sun group, entered into an agreement to acquire 37.7 per cent of SpiceJet for an estimated Rs 750 crore (Rs 7.5 billion). In March this year, SpiceJet disclosed that it had allocated warrants worth Rs 133.2 crore to the promoters, who had also infused equity capital to the tune of Rs 414 crore (Rs 4.14 billion). This reliance on the promoters' funding has alarmed experts. 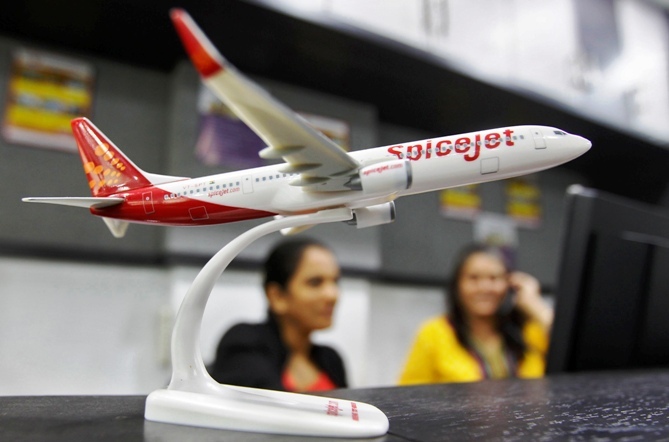 They warn that SpiceJet needs to speed up the process to rope in strategic investors. "The company is trying its best to attract investors by improving its brand image, showing positive numbers (improvement in market share and high load factor), appointing senior management (a new chief operating officer in November 2013 and new chief commercial officer in March 2014), but nothing has materialised till now," says an industry expert. The company's top officials agree that the balance sheet needs to be cleaned up, but, according to them, the problem is more of an external nature. For instance, they point out the dent made in the numbers by the rising cost of aviation turbine fuel (ATF), which accounts for almost 50 per cent of the overall operating cost. "We are turning around, give us some time and space," says a top official. He adds that if the value added tax (VAT) on ATF, currently levied at 25-30, was 4 per cent less, SpiceJet's loss in 2013-14 would have been halved. Thus, SpiceJet is looking forward to the meeting called by the civil aviation ministry on August 21 to work out a consensus on reducing VAT on jet fuel across all states to 4 per cent. There are also reports that the ministry is planning a financial bailout package for the sector, with loans at low interest rates for working capital through state-owned banks. "Maran is a serious businessman," says an analyst. His suggestion is that the airline should focus on route utilisation and rationalisation, not market share. He also cautions that promotional offers don't lead to increase in the load factor, obviously a reference to the 15 promotional fares offered by SpiceJet in the last six months. A company executive confirms that the carrier has dropped at least six destinations since November 2013 in an effort to rationalise operations. He says it is also focusing on maximising revenue. This, he explains, can be achieved by raising fares, improving customer base/ ratio and by getting more corporate clients and last-minute customers. While admitting that rival Indigo has done "a fantastic" job of roping in corporate customers, he adds, "irrespective of whether SpiceJet carries out the first two objectives, the third is the most important since it ensures the airline flies with fewer empty seats." There is some worry about how the negative reports will affect employee morale. But a company spokesperson says the staff and management have seen the positive performance trends reported for June. "In an internal survey carried out in April," he says, "over 90 per cent of the 4,500 SpiceJet staff surveyed said they believed SpiceJet was headed in the right direction." Some cabin crew members who Business Standard spoke to confirmed that they had not faced any problem regarding the timely receipt of their salaries. COO Kapoor himself was the subject of rumours that he was on his way out. He laughs off the speculation: "I have no intention of going anywhere; we still have a job to finish."